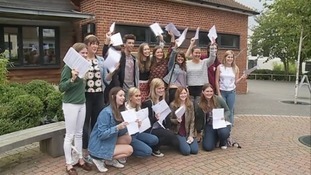 Students at Moulsham High School in Chelmsford get their A-level results. Photo: ITV News Anglia. Students at Moulsham High School in Chelmsford get their A-level results. Credit: ITV News Anglia. The number of students in our region getting A grades fell slightly while, nationally, the overall pass rate dropped for the first time in more than 30 years. Headteacher Mark Farmer said all his students who wanted to go to university had earned places - but the decision to go was now a financial one, rather than academic.